Abu Dhabi – 11th June 2018: In attendance of His Excellency Sheikh Nahyan Bin Mubarak Al Nahyan, UAE’s Minister of Tolerance, Abu Dhabi witnessed the premiere of ‘Estimrariya’, a short film that pays tribute to the legacy of the founding father of the nation, the late Sheikh Zayed bin Sultan Al Nahyan. 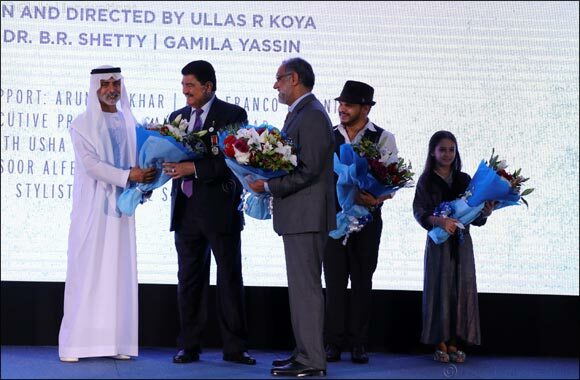 Written and Directed by debutant director, Ullas R Koya, the six-minute short film, Estimrariya, which means Continuance in Arabic, features noted UAE businessman and philanthropist. Dr B. R. Shetty plays the role of an elderly Arab citizen teaching his granddaughter (Gamila Yassin) about virtues the United Arab Emirates inherited from the late Sheikh Zayed. A team of talented and enthusiastic professionals played key roles behind the scenes of Estimrariya. Renowned cinematographer Franco Paroni took on the role of Director of Photography, while Indian filmmaker Arun Shekhar contributed as the creative consultant during production. The grandfather’s voice was rendered by UAE’s own revered actor, Mansoor Al Feeli. The film’s music is composed by Jakes Bejoy; and the editing is done by Sarath Usha Sasidharan. The film also involved Sandhya Shekhar as Executive Producer, Yavar Eskandari on Make-up; and Ihsan Al Shalabi as stylish. Estimrariya is not the first time that Dr. Shetty has been involved with a film. He has previously played the role of King Dharmaraja in the documentary ‘Saga of Benevolence’ and is producing the epic ‘Mahabharat’, the costliest Indian movie ever made.